Fixed with the last beta of Ender IO. The 3.2.4.0 BETA I just pushed will also address the crash. Hey OreCruncher, awesome work on the mod. I had a few questions regarding some issues(?) I'm experiencing with the Auroras. They work fine and are beautiful in singleplayer, though as soon as I log into a server I play on they seem to not work. Even after leaving the server and trying to spot them again on singleplayer, I can't seem to have them spawn. Does the server I am playing on need to have this mod installed for me to see them on my side? Edit: Actually I have managed to find them after swapping from server to singleplayer, so scratch that previous observation. I'm currently running Forge and Optifine. A lot of what I do in the mod is analyzing the area around the player and based on that info do certain actions. I guess it wouldn't be too bad for small servers with few players, but on larger ones it would become a source of lag. I should also point out that some features wouldn't be available because it would require client side code, such as speech bubbles and some of the particle effects. All good points. Yes, as much processing as possible should ideally be put onto the client and not the server. Someone needs to create the next generation Bukkit/Spigot, etc. in which client mods can be pushed to the client at server sign-on, much like having a resource pack pushed to you currently. Forcing the client user to install mods, and all that implies, is archaic, and fraught with downstream issues, no? Rather, the server could poll the client about the available mod/resource required to play on the server, and if the client responds with "I don't have that client mod installed", then it's pushed and installed, pre-configured. Believe it or not this was a pointed discussion when Sponge started. The big thing about pushing code down to a client is whether that code can be trusted. Would stink to attach to a server and have a trojan pushed down. Very true. If a super secure strict protocol was in place, I think the risks and any added overhead are worth taking for the humongous benefits. Spigot/Sponge, etal could require submitted dev uploads be automatically scanned for bad stuff, then zipped w a password sent separately to the downloader w checksum and image verification done at source and destination. Or many other possible identity schemes. Hah the current system has no such provisions, right? We download and run Java runtimes on our current systems all the time. Am I wrong or missing something? If we can push resource packs to the client, why not client mods too? Just do it right. In the farther flung future our computers will be mere thin clients or terminals, and everything will be pushed. 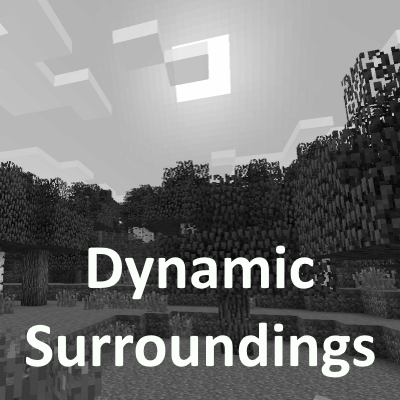 DynamicSurroundings is a perfect example of a game core add-on that should be pushed at login to the client - once initially, then differential updates only thereafter. But then, not today sadly. What may be better is to have a specialized mod/plugin on the server that provides a manifest to something like the Curse client. The curse client then can pull down all the specialized pieces. Curse goes through some sort of validation process when I post a new file update before you guys get a chance to see it and I figure part of that process is looking for nasty things in the JAR file. Just posted updated BETAs. The 1.11.2 version should run on 1.11 as well for those that want it. Could you make it also for 1.11? Not 1.11.2, as it already exists. Because I would want to use this but servers are 1.11 and cannot be joined with 1.11.2 or 1.10.2. Did you try it on 1.11? I think 1.11 and 1.11.2 mods are interchangeable. I am not completely sure, though. Atleast when I have tried using 1.11 mods on 1.11.2 or 1.11.2 mods on 1.11 many times, none of them has worked together. Forge always complains about mod wanting to run in different version. And just tested it; 1.11.2 version doesn't work with 1.11. I use ASM. ASM is used to patch up the java code on the fly during startup. If the underlying code changes between versions patches can be misapplied and a mess will result. This is why the Forge guys jump up and down about us modders using ASM. Sometimes, though, it's needed. Bandwidth. I am not sure about other modders, but I test the mod on the versions I support. Right now I am dealing with 3 Minecraft versions (1.7.10/1.10.2/1.11.2). Adding additional Minecraft versions adds more work on my end. This being said, the next BETA for 1.11 will have relaxed loading rules so it can load on 1.11. Anyone checkout the Armor sound overlays from the latest BETA? What do you think? Just tried it out. Unfortunately, could not hear any armor sounds. Tried turning on debug logging, but that button was non-responsive. Perhaps I should try the config file instead. Will do it. Checked all settings, armor sounds appear to all be 'true' and volume levels at 100%. Tried in singleplay and server play... same results. Hmmmm... just realized I installed one of your recommendations this morning -- Sound Filters. I'll try disabling that and see what happens. Ok, figured it out. The sounds *were* playing afterall, I just didn't recognize them as such. I suppose I must've been expecting more 'clanking', instead it's a bit more ruffling and muffling sound. Tried both iron and diamond. Able to distinguish the difference, but still no clank... which is why I missed it before. I was mistaking the new sounds for ground crunchiness sounds, but now know better. The Sound Filters mod had no bearing on the subject. What I am trying to avoid is making the sound so loud it drowns out the other effects. I am thinking of making them a bit louder. EDIT: The other thing you can try doing is increasing the footstep sound scale factor. By default it's 0.15, and making it a larger value would increase the volume.